Took off from Tinian. Part of 473 B-29s on a mission to bomb the city of Kobe with incendiaries. Over the target at the start of the attack, shot down by anti-aircraft fire and crashed at the Hyogo Prefecture Kobe City Mitsubishi shipyard near Kobe. Five of the crew went down with the bomber, the six others bailed out. The six survivors were taken Prisoner Of War (POW) by the Japanese and turned over to the Kempei-tai (military police) at Kobe. On or around July 20, 1945 Fitzegerald and Kennedy were executed at the Shinodayama Military Parade Ground near Osaka. The other prisoners died of disease during the war. "...we passed the mangled wreckage of an American B-29 Superfortress bomber lying where it had been shot down adjacent to the footpath. It was easily identifiable by its 2200 hp Weight Cyclone engines, part of the cowling which had been torn off in the impact, and by the distinctive twin-bogie undercarriage lying forlornly alongside. Post war investigations that it was probably the wreckage of Indian Maid, a B-29 Superfortress which was shot down by Japanese 'Tony' fighters over Osaka." The MIA crew members were declared dead the day of the mission and are memorialized on the tablets of the missing at Honolulu Cemetery (Punchbowl). The following crew members are buried at Honolulu Cemetery (Punchbowl): John Meehan at Plot P Row 0 Grave 832. Osmond Hannigan at Plot P Row 0 Grave 740. Joseph C. Kanzler (declared dead August 15, 1945) at Plot Q Row 0 Grave 819. "My uncle was John Driapsa. 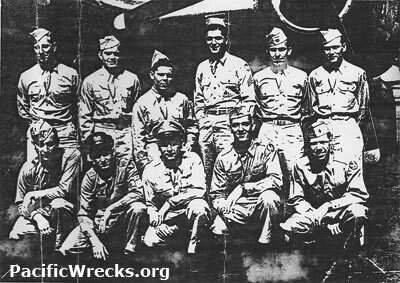 I have a picture of my uncle and a different plane with his original crew. He was on his first mission and was taking the place of another person (replacing Sgt W. O'Marrah of Chicago). John’s hometown was Bainbridge, Ohio in the south central part of Ohio."